I'm pretty proud of this one. 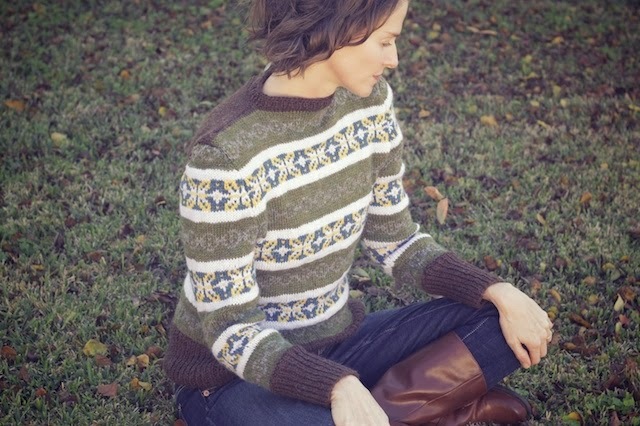 It's Sothern by Rohn Strong and only my second time to do real fair isle for the body of a garment. Though the vintage design had no waist shaping, which is always a plus, it did involve a gathered shoulder that proved challenging for me. 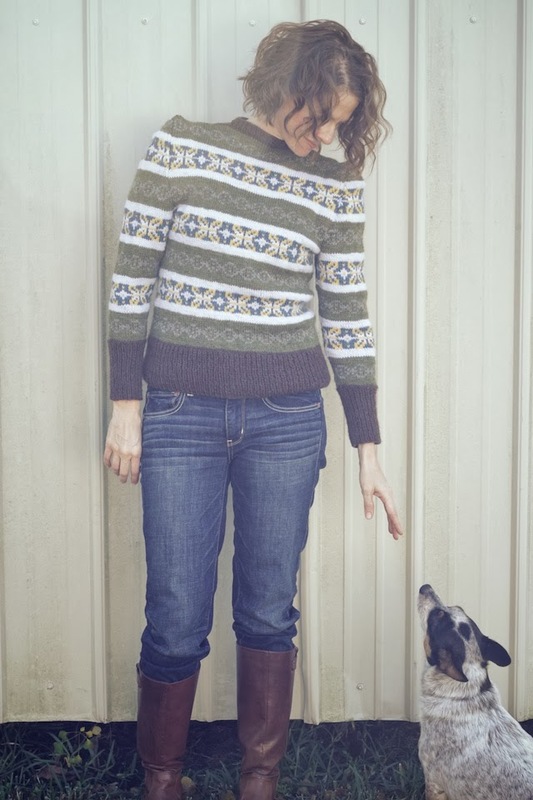 When I first saw the Fall 2013 Holla Knits Collection this was the pattern that called to me. I have nothing like this- high neckline, peep back closure, all the color, and those sleeves! So I accepted the challenge and ordered Wool of the Andes in baltic, cilantro, grizzly, and marble heathers, along with clarity. I added some stashed yellow to assuage any yarn accumulation guilt and I was ready to go. I wanted the cropped version but I have long arms and a long torso (think monkey) and, after swatching, knew the ribbing wouldn't hit me in the right place. Since my row count was a little bit off, I thought I could knit the full length version and still, possibly, get the slightly shrunken look. So I knit the long version in the smallest size and I'm satisfied with the fit. It's not too fitted but I can wear it with my low waisted jeans, which I will desperately need after holiday eating. The entire time I worked on this I kept thinking how classic it felt. The chart and the pattern itself. I felt like I was making something vintage and using techniques my great grandmother would have employed if she had knit rather than sewn. That's a good, grounded feeling to have about your making. The part I thought would be challenging wasn't. 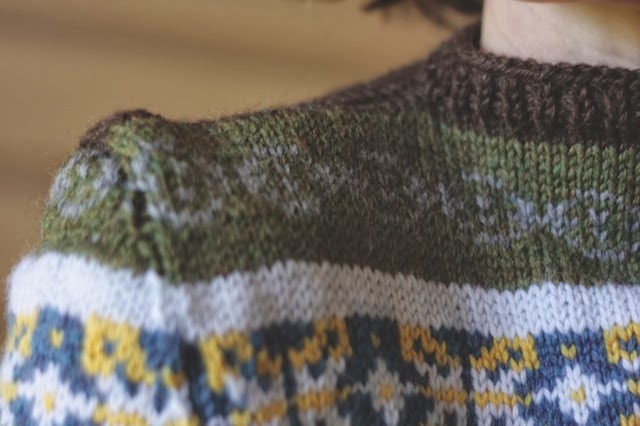 Most people see fair isle like this and think that all the color work will be hard. But it's no harder than paint by numbers. Working it flat helped me to keep the floats loose, too. I've never worked fair isle flat before. No, my difficulties came from my own tired brain. I knit at night and don't always read carefully or think things through. After working the body flat, I just started working the sleeves in the round. I have no idea why I didn't do them flat. It would have been easier. I also think my stitch count was wrong on one shoulder. 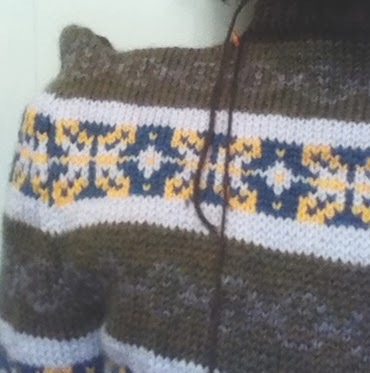 Thankfully, my gauge was the same on sleeve and body (Sometimes working fair isle in the round makes it tighter than when flat.) Most likely, they would have been easier for me to set the sleeves in had I worked them flat. Since I didn't, the seaming really kicked me. I could not get my shoulders to look right. I tried everything. I frayed two different seaming strands of yarn from all of the seaming, then ripping. My sleeve cap seemed to be too tall for the body and seaming it resulted in an extreme puffy shoulder that inched ever- upward, like it had been hung on the most misshaped wire coat hanger in existence. I've included a frustrated phone pic of it, below. It didn't look forties; it looked like a factory mistake. Or a birth defect. I tried a gathering technique I saw on By Gum By Golly, in which I ran a thread through the cap and gathered it before using mattress stitch to seam it. Even so, it seemed that my sleeve just wasn't the right width or height for the top of the body. So I had to modify. I used size 2 needles and reduced the cast on stitches for the body ribbing by 12 because my ribbing is always too loose. I just increased by 12 with the first even knit row in color A. For the shoulder fix, I undid my sleeve seams enough to free up the top of the sleeve cap on each side. Then I ripped back just the top of it. I started re-knitting it about 34 rows after the second underarm bind off. (I happened to be on row 3 of the color chart.) I decreased on the purl side once and did the K2tog, repeat row sooner so my sleeve caps came out a little shorter and less pointed. It wasn't a big difference, but I think it compensated for whatever mistake I made in the knitting. 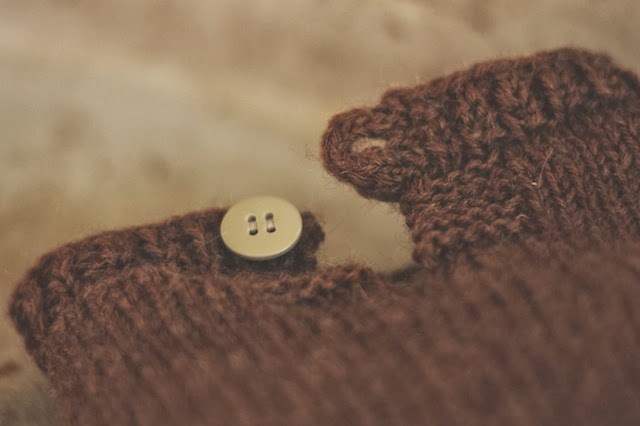 For the button loop, I just picked up 3 little stitches from the top corner of the right side of the neckband and knit a few rows of I-cord, then curved it downward to the place where I wanted to attach the loop. I picked up three more stitches from that area and joined the I-cord with it using Kitchener stitch. I like it and it feels sturdy. I'm so glad it worked out. It doesn't have as much gathering in the shoulder as I wanted, but it does have a hint of the vintage look I so admired and I think it's cute. This pattern was well written and thought out, so much so that I am positive the difficulty in seaming was due to my own knitting mistakes. 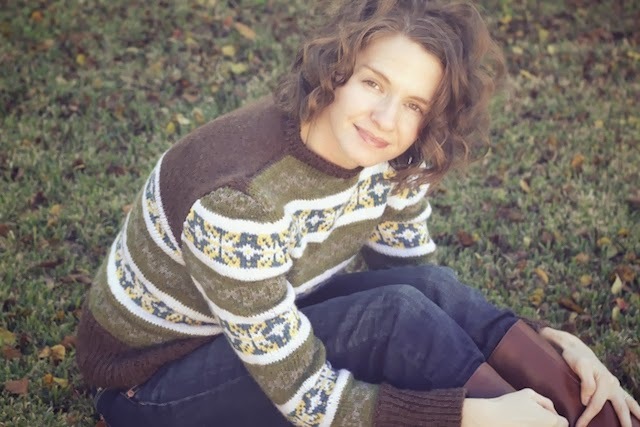 I haven't had a lot of experience seaming sweaters (I've only made a few that weren't seamless.) so I thought the pattern instructions for pressing the individual pieces before seaming was a nice touch. There is also an option to gather the front and back of the top a little, like the longer sample knit. I really like that look too. 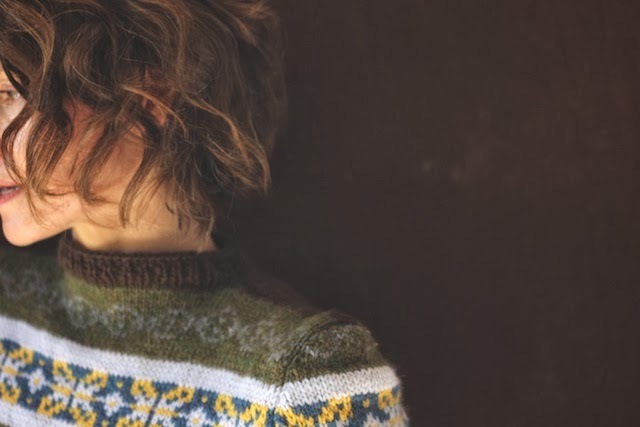 What I'm taking away from this project, besides the sweater itself, is more knowledge about knitting in pieces and more experience knitting fair isle. I've learned to weave in ends as I go and to really study my pattern before diving in. There's even a sense of pride that I didn't give up on the shoulders and braved ripping back to correct my problem. All that fiddling worked. 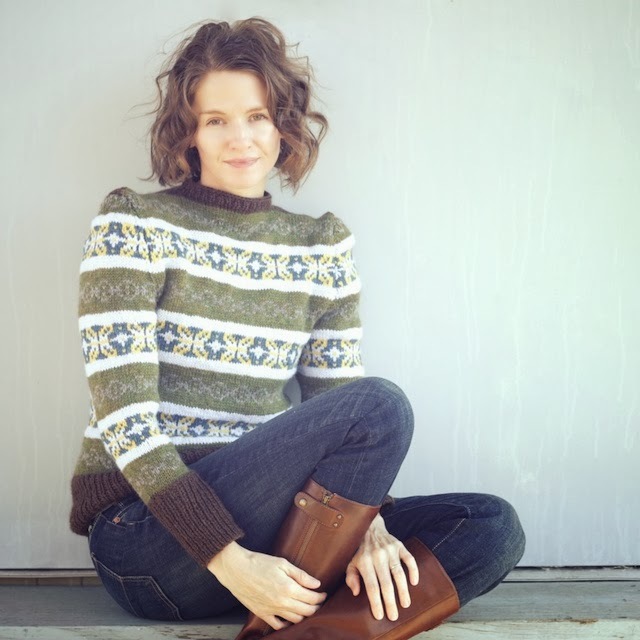 I'm also left with a desire to knit more from Rohn Strong. I'm thinking Betty... Betty Grable would be great for a Downton Abbey KAL, should there be one, when worn lace side up. It has a similar collar to a few jackets I've seen on the show. I think it would help me break into crochet. I also love the ease and casual look of Brando. His designer's page is here. Wow! Truly impressed! 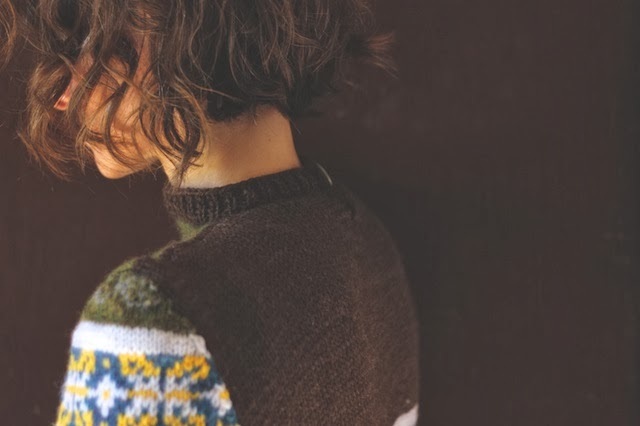 I think it takes another knitter to be able to really appreciate what goes into a sweater like this. I know I will not be attempting this in the near future. I doubt any of my family members would be speaking to me at the end of this project! Oh my goodness, Michelle! This is wonderful! You must feel so accomplished - and with good reason. This is definitely a win! And you pull off the vintage look so well. AH-MAZ-ING!!! It's just soooo beautiful! Your hair looks fabulous too! What an accomplishment! Thank you, Terri! I think, if my sleeves had failed, my family would have needed to avoid me :). I would've been crushed. That's "knitting fail" crushed, not truly crushed, but still... I think my understanding of fitting pieces together must have grown with this. I have much more respect for seamed knitting now. 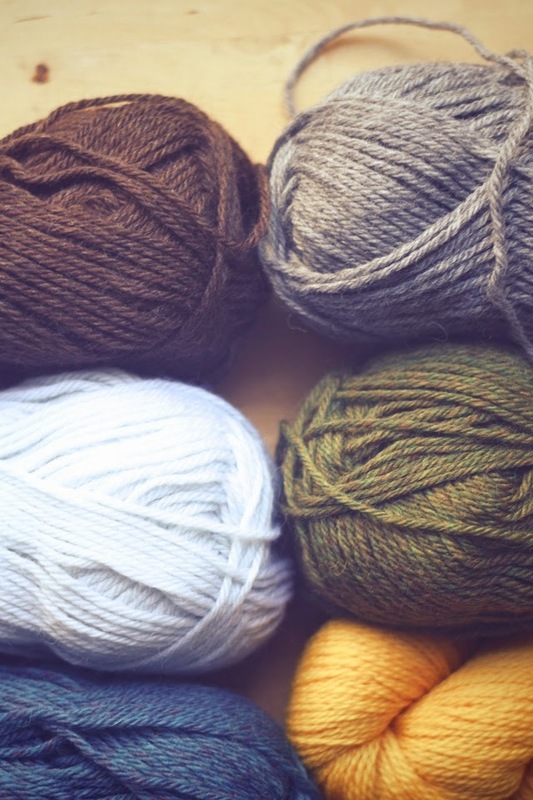 Btw, how did you knitted gifts come out? Oh, thanks, Jennifer. I really do feel like my knitting ability has been stretched and I've grown a little. 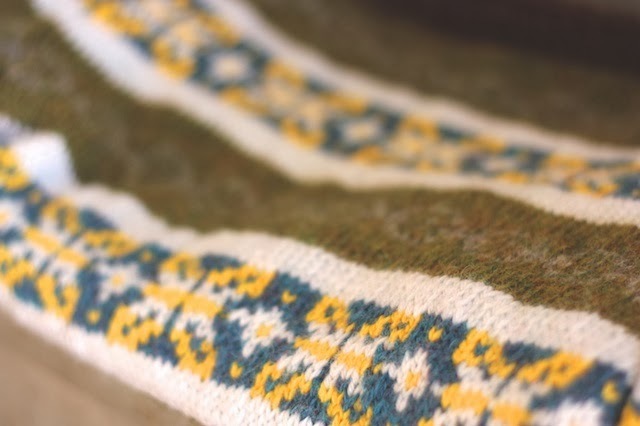 On the other hand, as soon as it was finished, I immediately cast on a chunky, seamless cardigan as a reaction to all of the fairisle and seaming. you should be proud, your Sothern looks gorgeous! and you do too!! This is so pretty! I love thw colours you chose. 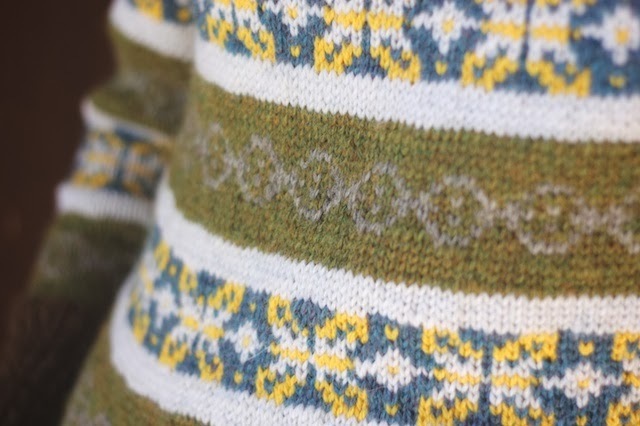 Christmas, fair isle, friend who spins/dyes.... all perfect reasons to learn to knit! :). I went digging from Flickr to your blog and found some of your paintings. I even found some birds painted on book pages. How excellent! Veronica you obviously "get" color. I'd love to see the combo you'd pick for a sweater. Better yet, to see yarn custom dyed based on your floral paintings, particularly those greens! Alas, I was only able to save 3 of my 7 pairs of boot cuffs! Frantically knitting bulky cowls as last minute stand in gifts. These were a combination of teacher holiday gifts and thank you gifts for the lovely ladies who helped with watching my children when I went to help my father recover after hip surgery. 5 ladies took a day for 2 weeks. They deserve boot cuffs and cowls!